Arizona Federal Credit Union has a new $3 Monthly Membership Fee! Greedy fatcat managers are forcing members to pay a mandatory $3 ripoff fee every month, simply for being a member. That's not mutually beneficial. | Arizona Federal Credit Union belongs to the member-owners, not Ronald L. Westad-President/CEO. http://www.arizonafederalcreditunion.com is not the correct website for AZFCU. The correct websites are listed below for AZFCU. You should first read “10 reasons why you should close your Arizona Federal AZ FCU accounts,” or else your money will slowly disappear as AZFCU “steals” it from you. so use those addresses for your AZFCU login. Before you go, it would serve you well to browse this site to see why over 35,000 smart members closed their accounts at Arizona Federal and went to a better credit union instead. Of the few areas in which AZFCU is the winner, other local credit unions can provide those services for less money than at AZFCU. Arizona Federal Credit Union says they believe in financial education. We are certain they will be glad we are providing this educational and informative comparison table to their members and prospective members. 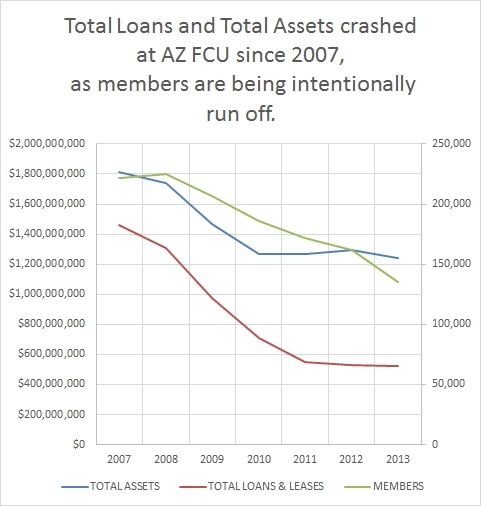 The smartest AZ FCU members have voted with their money, closing their membership at AZ Fed, moving their money to better banks and credit unions, as illustrated in these declining metrics since 2007. Browse the many pages on this site to see why AZFCU is not a smarter choice. Since 2007, over 40% of the members left AZFCU, which is over 90,000 members gone. Smart people have found the value proposition to be lacking at Arizona Federal Credit Union. Which type of person are you? How can AZ FCU’s spokesperson Steve Kelley, senior director of marketing, call himself a growth strategist? 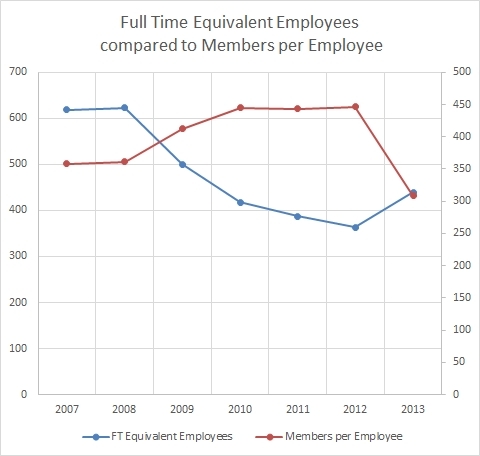 As AZ FCU has intentionally run off members, instead of serving them, the number of full-time equivalent employees has not dropped enough in relation to the number of members being served. When you have far fewer members to serve, you should need far fewer employees to serve them. 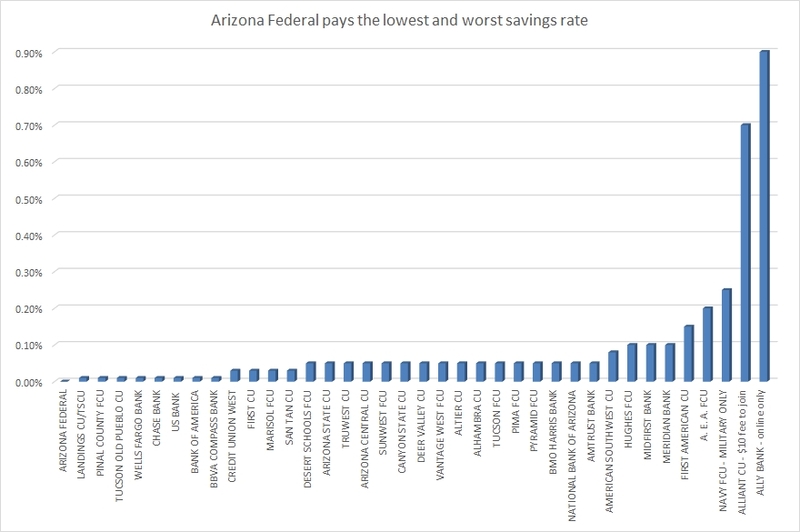 This shows that AZ FCU is not being managed well, in addition to the other terrible metrics. AZ FCU hopes you won’t realize they have the worst rates. Not only do they pay a low 0.01% interest rate on savings, they also charge $36 every year to every member. With a $10,000 share savings balance, at other credit unions, you will be saving $35 to $119 more than you would at AZ FCU. Restated, if you stay at Arizona Federal, you will be losing $35 to $119 more if you allow yourself to be pickpocketed for $36 every year at AZ FCU, compared to moving your money to a bank or credit union that doesn’t stick it to you. At AZ FCU, you are paying more in costs, but receiving less in benefits. In 10 years, you would be better off by $350 to $1190 more at somewhere other than AZ FCU. The sooner you move your money, the better. AZ FCU’s competitors allow you to keep more of your own money and save more money. Not only do other banks and credit unions have lower fees, they also pay higher rates. Don’t be bamboozled by Arizona Federal. AZ FCU thinks you are bad at math. If AZ FCU charges $6 million in annual member fees, then pays out $3 million as a “loyalty dividend,” you are collectively losing $3 million! In such a case, Arizona Federal members are only getting 50% of their money back. It’s similar to how casinos and lotteries advertise people winning money, without discussing how much they lose! When you look at the total return on investment picture of casinos, lotteries, and AZ FCU, you will realize they are foolish “investments” where you get back far less than what you invest. $36 in annual fees is not necessary to provide services like online banking, remote deposit, etc., as these services can easily be found elsewhere. At AZ FCU, you would need about $500,000 in your share savings account to earn enough interest at 0.01% to cover the $36 in annual membership fees. If you took that same money and deposited at Ally Bank at 0.84%, you would earn about $4200. 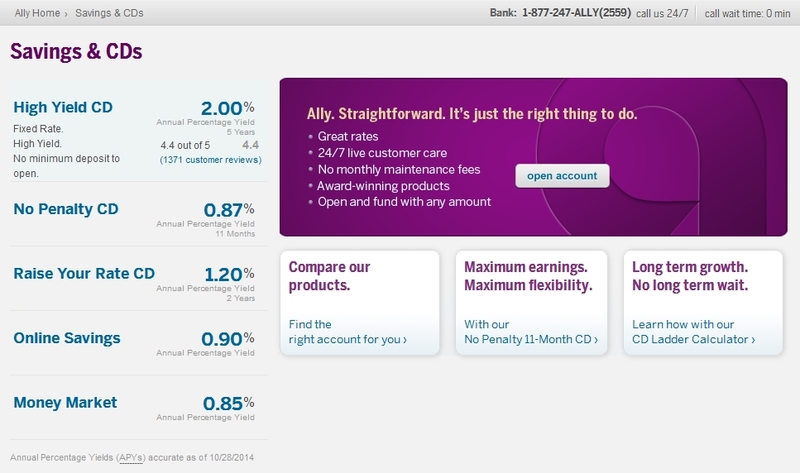 Add in the $36 in annual fees you won’t have to pay at Ally Bank, and you would be ahead by about $4200+$36 = $4236! AZ FCU doesn’t care if you stay with them. “We are not for everyone,” they say. It is unwise to be where you are not wanted. A hostile environment is not healthy for you or your financial future. AZ FCU thinks you are too lazy, complacent, and stupid to switch to a bank or credit union that values your business and gives you higher savings rates and lower loan rates. AZ FCU’s President, Ronald L. Westad, has destroyed his credibility. AZ FCU can no longer be trusted. Arizona Federal Credit Union has some of the highest fees compared to alternatives. Be smart with your money and financial future. Move your money. Over 35,000 of the smartest AZ FCU members left AZ FCU in just 1 year! That means, over 21% of the members got fed up and moved their money to where they don’t get charged unavoidable $3 monthly fees. They don’t want to be robbed by the unavoidable monthly $3 ripoff fees at AZ FCU, especially when there are countless alternatives that are better for your wallet. 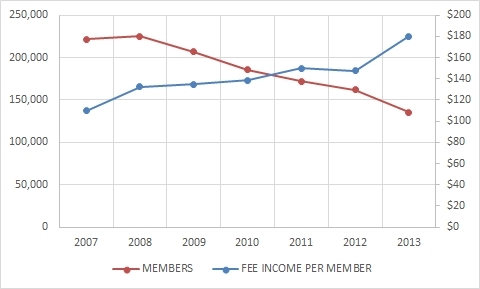 Since 2007, as fee income per member went up 64%, it should come as no surprise that members declined by 39%. Did management salaries go down in proportion to the poor performance or did President Ronald Westad get a raise and bonus? The biggest changes happened in 2013, as AZ FCU added $36 in annual fees, over 27,000 members left that year. Running off members, intentionally, is a bad strategy because there are fewer members supporting the overhead, and a loss of economies of scale. That is a key reason why smaller credit unions are merging out of existence. In addition, fewer members means you will have fewer future borrowers, which leads to a smaller loan portfolio, which leads to lower profitability. Kicking poorer, younger members to the curb is a short-sighted strategy, akin to getting rid of all your baby chickens because they are not producing eggs. What happens in the future is obvious. Baby chickens grow into big chickens and begin laying eggs, at which point they are more productive. AZ FCU management, with their unavoidable $3 monthly fees, has sent thousands of future borrowers to other credit unions. Those members won’t forget what Arizona Federal did to them. Smart members go where they are not hit with excessive fees. Only the less informed members stay at AZ FCU, or those too lazy to switch to a more caring credit union. Don’t be a sucker! Move your money! Don’t get ripped off by $36 EVERY YEAR to line the pockets of management, when similar services can be found FOR FREE at many other financial institutions. Consider your share savings balance and see if you would save money by moving to a different bank or credit union. The answer is YES. According to this handy table, every member at Arizona Federal is being ripped off – except for management, who is likely getting a bigger bonus and/or wage increase, AT YOUR EXPENSE! Handy table is listed in ascending order from worst at AZ FCU, to best at Ally Bank. If you have $10,000 in savings at Arizona FCU, it will COST you $36 per year and earn you $1 in interest, for a net loss of $35. Alternatively, Ally Bank will pay you $90 per year. This is $89 MORE earnings at Ally Bank than Arizona Federal Credit Union! Factor in the $36 fee that AZ FCU charges EVERY YEAR vs no fee at Ally Bank and you are better off by $89 more interest earned+$36 annual fee you don’t have to pay at Ally Bank = $135 ahead at Ally Bank, compared to having $10,000 at Arizona Federal. With a $100,000 balance in savings, the difference is even more astounding! If you have $100,000 at AZFCU, it earns you $10 while at Ally Bank, it earns you $900, or $890 more. Factoring in the $36 fee, you would lose $26 at AZ FCU with a $100,000 deposit every year. Accordingly, you would be better off by $890 more interest earned +$36 annual fee you don’t have to pay at Ally Bank = $926 ahead at Ally Bank compared to AZ FCU with $100,000 in a savings account. Now, don’t be selfish like the executives at AZ FCU. Don’t simply move your money and close your accounts. Be sure to also tell your friends and neighbors to move their money as well to anywhere but AZ Federal. Post a link to this site from your Facebook, Twitter, etc. NAME savings rate $10,000 balance earns how much annually, after $36 unavoidable fees? $100,000 balance earns how much annually, after $36 unavoidable fees? $360,000 balance earns how much annually, after $36 unavoidable fees? $1,000,000 balance earns how much annually, after $36 unavoidable fees? Example balance earns how much annually, after $36 in unavoidable fees at AZ FCU? Arizona Federal’s “The Power of US” slogan means that the insulting $3 unavoidable monthly fees are powering Arizona Federal to the detriment of its members. Why get ripped off for $3 monthly, which is $36 annually, when you can go elsewhere to join a bank or credit union that doesn’t have this ripoff fee? In addition, while they try to spin it as something special, you aren’t getting superior benefits. A 0.01% interest rate is one of the worst in the market. They also falsely claim it is needed to pay for online banking or other services, but these same services can be found elsewhere for free. See easy options for how you can avoid monthly fees at these competitors. 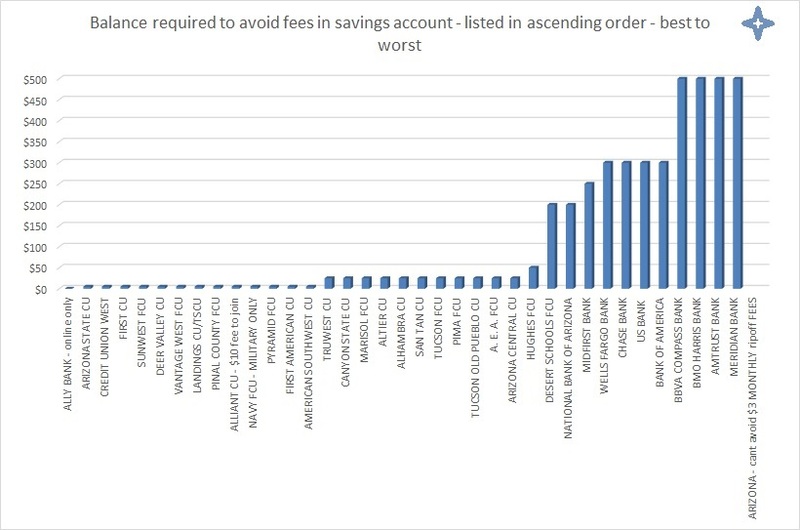 Savings rates listed in ascending order, from worst to best. Arizona Federal is the worst! Low information members keep their money at AZ FCU. Smarter choice members move their money where they aren’t ripped off, not only by the low interest rates that Arizona Federal pays, but also by the unavoidable $3 monthly ripoff fee. How much money on deposit do you need at Arizona FCU to cover the $36 in annual fees? About $500,000! Arizona Federal Credit Union pays extremely low, uncompetitive rates on its share savings account, only 0.01%. Once you factor in the unavoidable $3 monthly weasel fees, which come to $36 in yearly fees, you could suffer a huge negative return. In fact, in such a scenario, you might be better off burying your money in the backyard or hiding it under your mattress! As a part of Arizona Federal’s “financial education” program, do they explain how this is a big ripoff? For example, if you have $100,000 in your share savings account, you would earn 0.01% interest which would be $10 in interest earned for the entire year. Then to experience the phony “Power of Us,” you would be paying $36 in fees, for a loss of $26! In order to break even on the annual $36 weasel fees, one would need to have a $360,000 balance in a share savings account! However, one would need MORE THAN $360,000 at 0.01% to break even, because the $36 earned on a $360,000 balance would be before tax! Depending on your tax bracket, it might take $500,000 or more to cover the $36 annual weasel fee. $500,000 x0.01% = $50 interest earned. In a 30% tax bracket, $50 interest earned–$15 in taxes = $35 remaining, after tax. That same $500,000 at Ally Bank, at 0.84% = 0.0084 would earn $4200 in annual interest! See this other post for alternatives, many of which are paying far higher than Arizona Federal Credit Union.